Image: Kim Kardashian and Kanye West nestle into Kathy Temin’s “White Forest: White Christmas”, a fantasy inspired forest created from synthetic fur and materials that evokes childhood memories and feelings of joy. Image source Kim Kardashian Instagram. “It’s like a winter wonderland Whoville” Kim Kardashian said in her Instagram Story video, referencing the fictional town created by Dr. Seuss in his children's books. 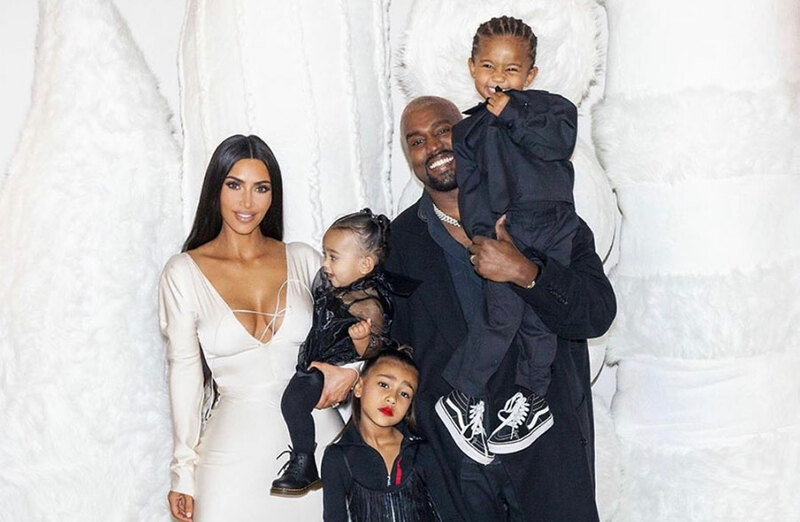 American rapper and entrepreneur Kanye West came across Temin’s work while seeking inspiration for their annual star-studded Christmas party. 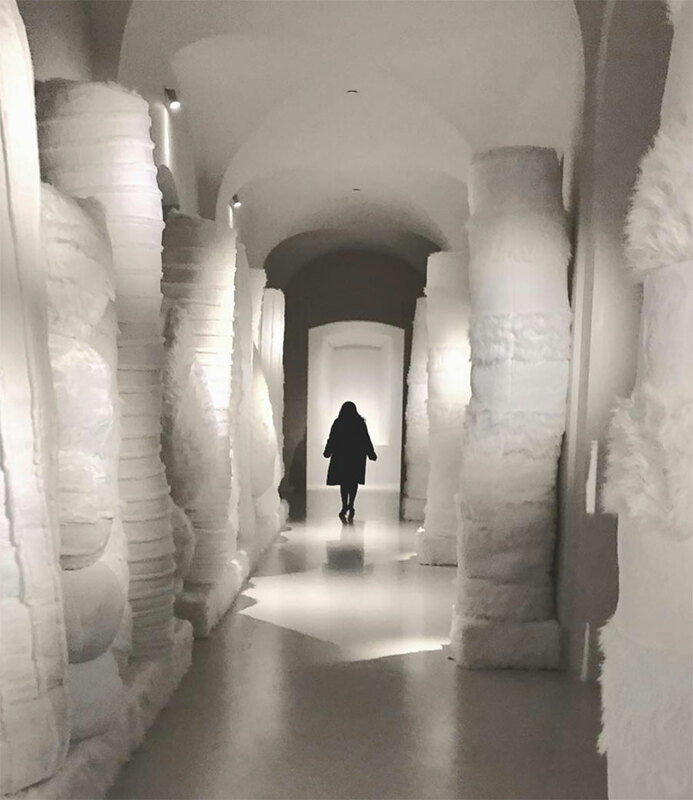 Image: Temin walking through the “White Forest: White Christmas”, 2018 installation. Image: Nick Smith. source Kathy Temin Instagram. Temin’s “White Forest: White Christmas” commission consists of 64 large tree-like forms. Constructed from steel, wood and MDF, then covered in Temin’s signature material – synthetic fur – the rows of trees made in response to the architecture of the house create an internal forest, that is both visually and texturally immersive for the viewers. “The forest works have different references in different contexts. 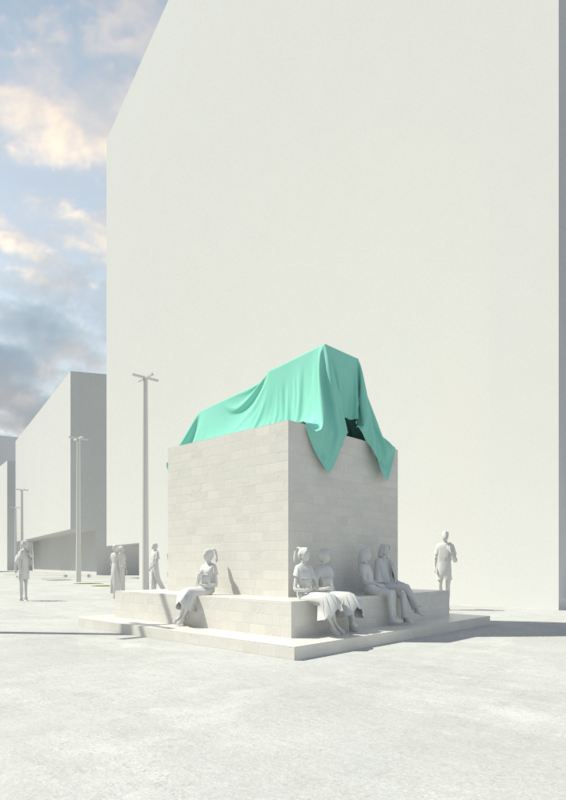 For example, ‘My Monument: White Forest’ is about the oppositional dialogue of adversity and optimism. The repetition of the idealised trees, with their symbolic or childlike form, seeks to create an engagement with remembrance and comfort” said Temin. Temin is a prominent Australian contemporary artist with an international reputation for her sculptural practice, with her works held in major museum collections across Australia. Most recently “My Monument: Black Gardens”, 2010 was included in the exhibition “Spacemakers and roomshakers”, at the Art Gallery of New South Wales, Sydney. Temin currently balances her time between her art practice, overseas commitments and her role as interim Head of Fine Art at Monash University, placing her in a critical vantage point to observe the changes within the Australian art scene. “Australian artists utilise ideas and technologies from a myriad of industries and philosophies, to create works that address issues of gender, race and colonialism. I am particularly interested in social inclusion, and of artists exploring themes such as cultural identity and gender” said Temin. “Monash University Fine Art is positioned at the centre of this discourse and plays a vital role in developing future artistic leaders. By providing a space to engage with a creative community, Monash allows young artists, historians and curators to have a dialogue, to help them uncover their own artistic voice." 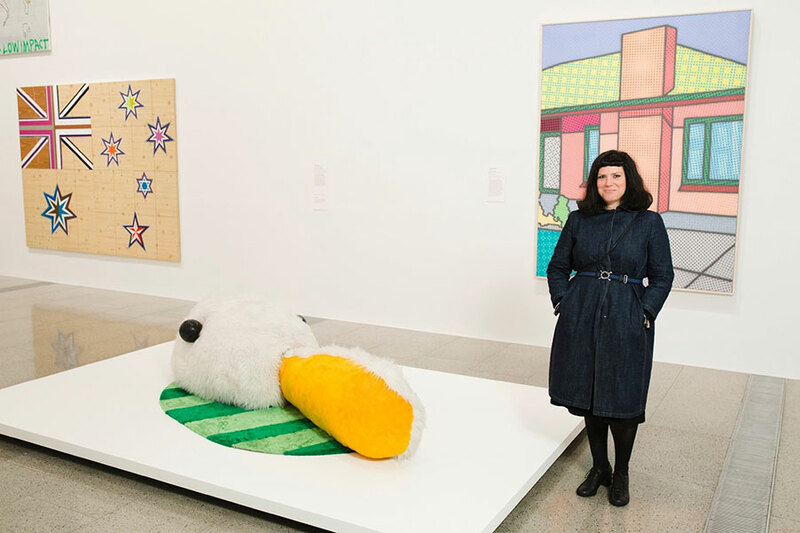 Image: Kathy Temin with Duck-Rabbit Problem, 1991, NGV Collection, Melbourne in 2017. This work was included in Every Brilliant Eye: Australian Art of the 1990s, National Gallery of Victoria, Melbourne. Image source NGV Twitter. "The artwork and research coming out of the school reflects the critical issues facing society now. We’re providing our students - emerging artists, writers, curators and innovators - with the tools to understand the present, and envision the future. Our students finish their studies industry ready and engaged in the world” said Temin. Monash University offers a Bachelor in Fine Art, Art History and Curating and Visual Arts and Fine Art postgraduate by research.